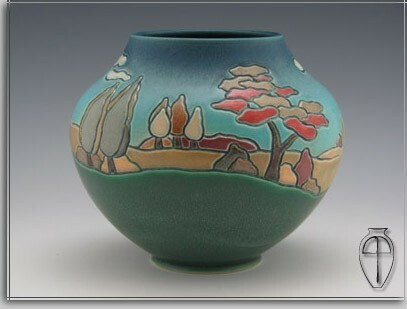 My interest in American Art Pottery began at Edinboro University of Pennsylvania. A field trip to the Erie Art Museum showcasing Teco Pottery left me spellbound. I was amazed with the variety of glazes enveloping the buttressed pieces so that each curve and line was clearly defined. What struck me most about the work was the high quality and the elegance of simplicity. During college, I explored glaze development, discovering how the right glaze could transform a piece. To hone my throwing skills, I worked as a production potter after graduation. Through repetition, I acquired the skills and discipline to produce consistently good work. In 1994, I started my own studio to develop my own body of work. Soon I saw traits in my work that are prevalent in pottery from the Arts and Crafts Movement. Like many pieces of that period, my own work featured repeating designs with visual and tactile appeal. After this discovery, I began collecting American Art Pottery and studying the numerous companies and artists involved. 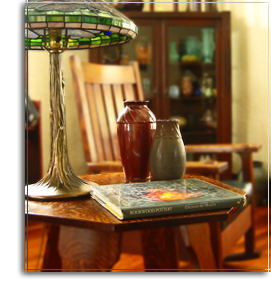 By exploring thousands of period pieces, I became infatuated with the works and stories of Artus Van Briggle and the artists at Rookwood Pottery especially William Hentschel, Jens Jensen, and Reuben Earl Menzel. Their use of stylized designs to enhance form is reflected in my own work. As I continued experimenting with simple carved and incised decorations, I realized that it was important to find my own “identity.” I wanted to embrace the philosophy of the Arts and Crafts Movement rather than create reproductions of the work. In my work, you will find elements of not only the Arts and Crafts style, but also Art Nouveau and Art Deco inspired designs incised on classic forms. After 30+ years of working in clay, I am still attracted to strong simple forms with beautiful surfaces and incorporate this passion in my work. From throwing to decoration to glaze work, I strive for excellent craftsmanship that unites form, design, and surface. In my journey as an artist, I continue to develop new glazes, designs and forms, aiming for a timeless, honest quality in my work. I hope collectors of my work will enjoy the journey and the pleasure that my craft may bring to their daily lives.